Thank you for deleting reservations you are unable to make, it allows other students to book the room. This entry was posted in facilities, group study rooms, Uncategorized on April 5, 2016 by libsuggestions. What is going on to the Vanier Library 3rd floor and will study spaces be accessible any time soon? Thank you for your question. Major renovations are underway at the Vanier Library. These renovations form an important part of the Libraries’ overall plan to improve the efficiency and quality of its spaces. The Vanier Library component is closely related to the plans recently unveiled for the Webster Library. The Vanier Library will be the scene of construction throughout the remainder of the Winter semester continuing until June 2014. The construction work will be on the third floor. The work zone will soon be contained within a temporary wall, specially insulated to reduce noise. Emerging from this cocoon in early June will be new study facilities and office spaces. These renovations will not decrease the number of study tables at the Vanier Library. Although the study tables on the third floor will be relocated (mostly to the second floor), all tables will remain accessible to students throughout the construction period. The renovation project will also provide two additional, new group study rooms. These rooms, plus two of the existing rooms, will be specially equipped with new technology to support collaborative learning. 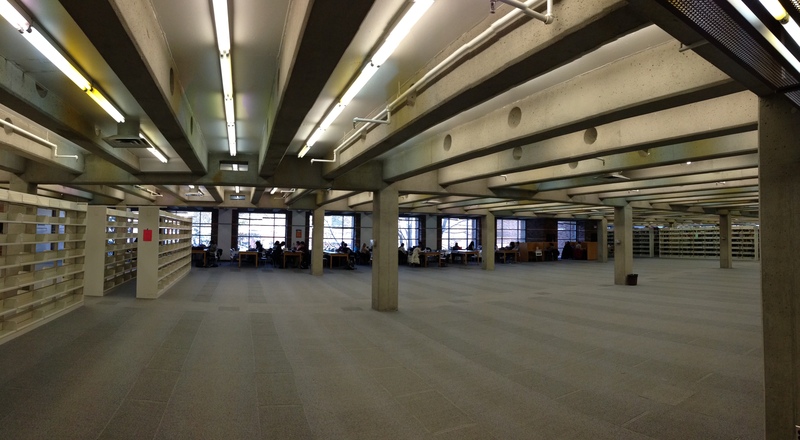 The renovations will not affect students’ access to the stacks. Nor will this project reduce the library collections. Most books from the third floor have already been shifted to the second floor, thanks to space gains made by the compact automated shelving installed last year the ground floor of the Vanier Library. An important feature of the Vanier Renovations is the creation of a new office area for the Libraries’ Collections Services Department. This department, responsible for ordering and cataloguing the Libraries’ electronic resources, books and journals, will move from the Webster Library to the Vanier Library in June, thus liberating a major area for redevelopment in the Webster Library. Focus of the Webster redevelopment will be the creation of expanded and enhanced study facilities for students. This entry was posted in collections, configuration, facilities, group study rooms, tables on February 4, 2014 by libsuggestions. I tried out the media:scape system today when using the viewing room for a group project today. Great initiative! to light up but the monitor didn’t show anything. Wanted to let you know that it’s not working as easy as it should be. Good initiative though! Thank you for reporting this. I have sent in a ticket to our technical support team. By the way, for those of you that don’t know about media:scape, as a trial project, we have added media:scape to LB-351, the Webster Viewing Room. Media:scape is furniture and technology integrated together with dual screens to allow you to share information from your tablets and laptops. To try it out, just book LB-351 (the Webster Viewing Room). Sorry folks, media:scape is now on the second floor of the Webster Library, right next to the public holds shelf. We are having some technical problems with it right now but we hope to resolve them soon. This entry was posted in audiovisual equipment, group study rooms, Media Room, workstations on December 13, 2013 by libsuggestions. Is it possible to see a list of all the study rooms and when they are available? Because when I enter a certain time, I get one room, another time, another room, but I can’t get a complete picture so as to book one. Especially during these busy times, I feel like it should be easier. I agree with you that the group study booking system is not the most intuitive one. I believe that the Libraries’ Systems office is working with the University’s IT team to find a university-wide solution. In the meantime, here is a video that shows you how to book a group study room. And here’s a hint: if you would like to have a listing of all the rooms and times available in one library, change the date to 2-3 days away. That will show you all the rooms and all the times available for those few days. Once you’ve identified a time that is available and that suits your schedule, back-track and put in that day and time. That usually works! I will also send your email to our Systems Team. Thank you for writing. This entry was posted in group study rooms on October 22, 2013 by libsuggestions. create sections in the library where groups of 2 or more can discuss assignments/projects, rather than disturb everyone in the general library study area. especially in the blue zone. Thank you for your message. Students are allowed to congregate and discuss assignments in a low voice, in the orange zones. To see all the orange zones in the Libraries, please consult our floor plans. We also have group study rooms that students may book online. Here is a video that explains how to book these rooms. This entry was posted in group study rooms, noise, quiet study spaces on September 6, 2013 by libsuggestions.